An amazing deal from Ryujin - this is a monotempered 1045 carbon steel blade mounted in tough, form fitted ABS plastic made to imitate the traditional style of wood and shagreen. The factory sharpened blade is 6" long, measured from the back notch of the solid brass habaki. 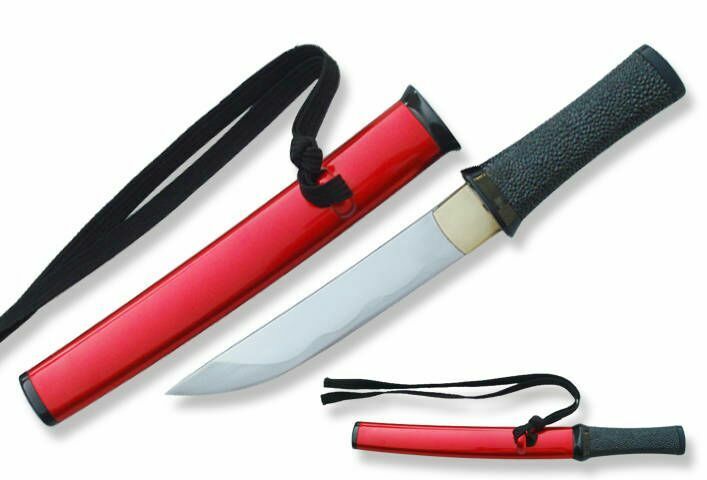 Includes a small wooden saya with red glossy lacquer and length of black sageo. Don't be fooled by the low price, the combination of the mono tempered 1045 carbon steel blade and hard wearing ABS makes it a sturdy little piece that may surprise you with its durability.